The Wisconsin School Garden Network, supported by the Wisconsin Partnership Program since 2008, was recently featured on "Forward Motion," a news magazine airing on the Big Ten Network that highlights the inspiration behind some of UW-Madison’s most innovative research and teaching. The Wisconsin Partnership Program continues to support the School Garden Network’s work through a five-year, $1 million community impact grant to the Cultivate Health Initiative, a project that expands the Wisconsin School Garden Network throughout the state. The grant is a community-academic partnership between Community Groundworks and the UW Environmental Design Lab to support both urban and rural educational gardens in five regions throughout Wisconsin, and assist more than 2000 gardeners, educators and volunteers statewide on best practices in garden-based education. The Wisconsin Partnership Program is committed to improving the health and well-being of Wisconsin residents through investments in research, education and community partnerships. 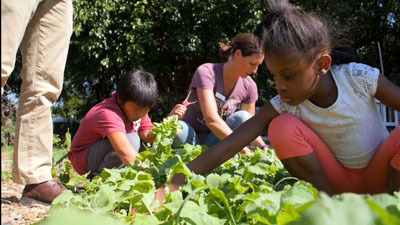 Pioneering studies show that garden-based education in school and early-childhood settings can improve child health through the development of positive associations with fruit and vegetables and opportunities for physical activity. By building strong connections between educators, support networks and resources, the project is working to sustain Wisconsin’s many educational gardens.